I remember when my son was a toddler, and I spent 30 minutes getting him all dressed up in his snow gear, only for him to get outside, cry, and come right back in. Those days were tough. 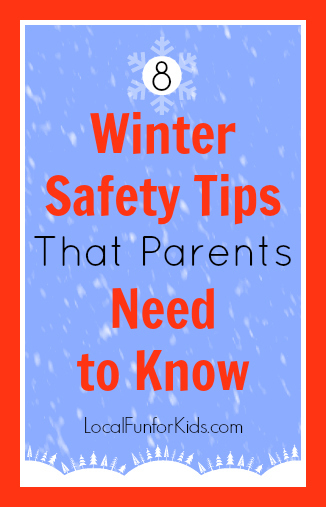 Now, a few years later, it's definitely much easier, but it's always good to read up on some tips for keeping your kids safe when they're playing on snow or ice. 1) Warm layers are key. Dress infants and children warmly for outdoor activities. Several thin layers will keep them dry and warm. Don’t forget warm boots, gloves or mittens, and a hat. 2) Dress kids a little warmer than you would dress yourself. The rule of thumb for older babies and young children is to dress them in one more layer of clothing than an adult would wear in the same conditions. 3) Don't forget the sunblock. The sun’s rays can still cause sunburn in the winter, especially when they reflect off snow. Make sure to cover your child’s exposed skin with sunscreen. 4) Be careful when sledding. Children should be supervised while sledding. Sledding feet first or sitting up, instead of lying down head-first, may prevent head injuries. Avoid sledding in crowded areas. 5) All skiers and snowboarders should wear helmets. Ski facilities should require helmet use, but if they do not, parents should enforce the requirement for their children. 6) Do not take children under age 6 on a snowmobile! The American Academy of Pediatrics recommends that children under age 16 not operate snowmobiles and that children under age 6 never ride on snowmobiles. 7) Allow children to skate only on approved surfaces. Check for signs posted by local police or recreation departments, or call your local police department to find out which areas have been approved. 8) Be sure to set reasonable time limits on outdoor play to prevent hypothermia and frostbite. Have children come inside periodically to warm up. To read more Simple Tips from then American Academy of Pediatrics check out their Winter Saftey Tips here. Do you love taking your kids out to play in the snow, or would you rather be inside with a hot drink? Leave me a comment below.